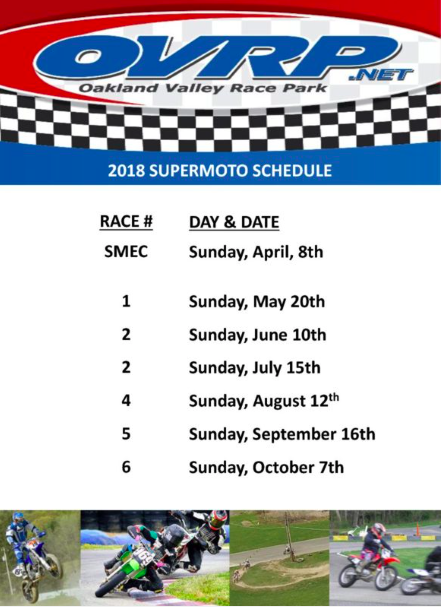 2019 SUPERMOTO & ROAD RACE SCHEDULE AND CLASSES WILL BE POSTED SOON! IMPORTANT NOTICE: PLEASE CALL OR CHECK THE CALENDAR AT OVRP.NET PRIOR TO COMING FOR MOTO OPEN PRACTICE. DUE TO THE ADDITION OF OUR NEW CRG RENTAL KART FLEET, WE WILL HAVE DEDICATED HOURS FOR MOTO OPEN PRACTICE AS WELL AS DEDICATED TRACK TIME FOR RENTALS. Open Practice Day Fees with your own kart / bike: $65 Track Fee ($45 for Members) for the day plus $15 – Pit Pass (required for all members of your group per day). OVRP SUPERMOTO RACE SCHEDULE & POINTS, CAN BE FOUND ON THE “FORMS & DOCS” SECTIONS OF OUR SITE. Get geared up and ready to go for this year’s best Supermoto & Road Racing on the Northeast’s premiere track, OVRP. For OVRP calendar of events, click here. 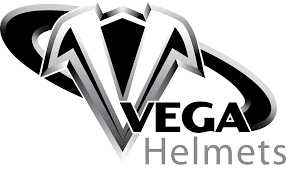 Interested in motorcycle racing? OVRP is a great place to get on the fast track. We offer a variety of outdoor racing activities for a wide variety of ability levels and ages. From young beginners, to seasoned riders–OVRP is where racers come from all over the northeast to experience the thrill of motorcycle racing. OVRP is perfect for the recreational racer who is just looking to have fun, as well as for the serious racers who are looking to compete and drive full speed in a controlled and supervised environment. One-on-one learning–OVRP’s Introduction to Racing is great way to start motorcycle racing for beginner riders. Learn safety and race craft skills that ensure riders develop proper racing techniques and habits, from caring instructors who help student racers safely navigate the complexities of the motorcycle and track. Advanced instruction is also available for riders who would like to hone their race craft or improve lap times. Each program is tailored to suit the individual student and progresses at the student’s pace. It’s a great way to get a feel for motorcycle racing without going all in. For OVRP track rules, regulations & information, click here. Announcing the 2019 OVRP Club Championship Schedule!! The upcoming OVRP Club Championship will consist of 14 races. Four reverse direction races will be held, with Saturday practice available. Additionally, there will be two Night Races, as well as a Double Points Race Day featuring two Finals! As always, there will be one drop race. OVRP is introducing a new 100cc Air-Cooled class for 2019. This class offers a cost effective way to get involved in close, competitive kart racing. Rok VLR, IAME KA100, and Yamaha KT100 engines will be included in the class. To view and/or download the Schedule, Class Structure, and Specifications for 2019, visit the 'Forms & Docs' of OVRP.net. It's set to be another exciting season for OVRP, and you won't want to miss out on the action. Our Club Championship has recently grown stronger year by year, and we expect that to continue in 2019. One week following the New York State Championship is the OVRP Karting Awards Banquet! We invite you all to come and celebrate what a fantastic season it has been and honor our 2018 Club Champions and NY State Champions. The event will take place on Saturday, November 10th from 12:30-4:30pm. Be sure to RVSP by November 1st. The registration form can be found on the ‘Forms & Docs’ of our website.